2017 has been a great year for me, three new albums have been released and I have been able to enjoy the happiness that comes from sharing new musical productions with all of you. Enjoying that feeling is one of the best experiences an artist can feel. 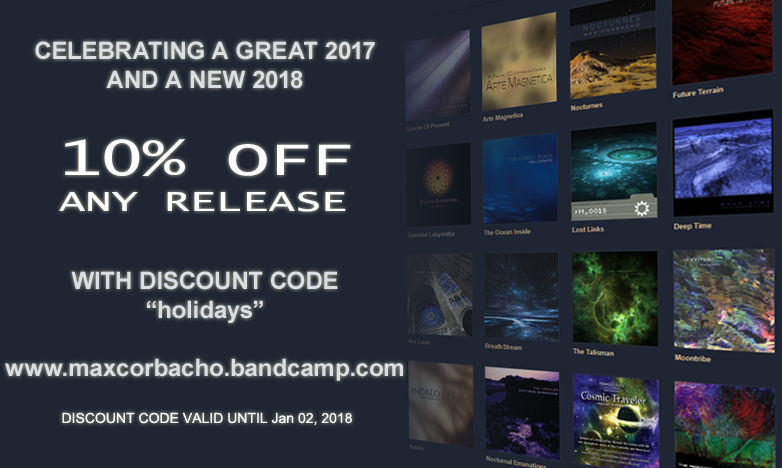 To celebrate these days with you, all my albums, including the CDs, have a discount of 10%, which you can get during the purchase by entering the code "holidays" (without the quotes) in my Bandcamp store. This discount code of 10% that is good for any item can also be applied to a full digital discography purchase, which is already reduced by 25%, so the purchase of the complete digital discography with this code has a total discount of 35%. Code valid from now on, Dec 19, to Jan 02, 2018. Remember also that all digital downloads and physical albums have the option "Send as Gift". Finally, and most important of all, whatever you celebrate during these special days, I wish you to enjoy peace, love, and happiness with your loved ones and also I send you my warmest wishes for health and happiness for 2018. Thank you very much for your continued support towards my musical work, for which I would like to express my sincere gratitude.